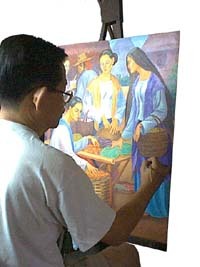 The artist spent his youth in the town of Gapan in Nueva Ecija. Went to Manila in 1960 to find work and at the same time study Fine Arts at the University of Santo Tomas. In 1964 joined the art staff of the National Museum until 1966. In 1967 the Museum of Philippine History and Iconographic Archives (presently the Ayala Museum) hired the artist, among others, to build the now famous dioramas of Philippine History. Stayed with Ayala Museum as Staff Artist until 1981. Built dioramas for other institutions such as the National Historical Institute, PANAMIN, Quezon Memorial Museum, Philippine Army Museum, NFA Grains Museum, Villa Escudero Museum and the Philippine Military Academy. Joined group art exhibitions with the Ayala Artists Group. Held a one-man art exhibit at the Heritage Art Center, SM Mega Mall, in December 1995. Presently, the artist is a free-lance painter and resides in No.31 Rizal St., Brgy. Poblacion, San Pedro, 4023 Laguna, Philippines.